Funding: No funding was received for the preparation of this manuscript. Abstract: We reviewed the literature on transcranial magnetic stimulation and its uses and efficacy in schizophrenia. Multiple sources were examined on transcranial magnetic stimulation efficacy in relieving positive and negative symptoms of schizophrenia. Literature review was conducted via Ovid Medline and PubMed databases. We found multiple published studies and meta-analyses that give evidence that repetitive transcranial magnetic stimulation can have benefit in relieving positive and negative symptoms of schizophrenia, particularly auditory hallucinations. These findings should encourage the psychiatric community to expand research into other applications for which transcranial magnetic stimulation may be used to treat patients with psychiatric disability. Schizophrenia is arguably the most debilitating of psychiatric illnesses, psychologically, socially, and financially. Starting in late adolescence to early adulthood and with a lifelong course that typically is characterized by relapses, the impact of schizophrenia on the individual who suffers from it is both pervasive and prolonged. Symptoms of schizophrenia are grouped in several ways, one of which is to divide them into positive or negative symptoms. Positive symptoms of schizophrenia include hallucinations, delusions, disorganized speech, and grossly disorganized or catatonic behavior, while the negative symptoms include affective flattening, alogia, anhedonia, and avolition. Pharmacotherapy with antipsychotic medication remains the mainstay in the acute and maintenance treatment of schizophrenia. Antipsychotic agents (first, second, and third generations) have been shown to be most effective in reducing the positive symptoms of schizophrenia, but unsatisfactory in reducing negative symptoms and the propensity to relapse. Furthermore, almost one-third of patients with positive psychotic schizophrenia do not respond to antipsychotic medication. Medication nonadherence is also a significant issue in the treatment of schizophrenia, with nonadherence rates of over 70 percent during the course of one year. There is also a significant side effect burden with antipsychotic medications, including extrapyramidal symptoms, weight gain, and metabolic abnormalities, which may make antipsychotic medications less acceptable to patients and their families. Due to the limitations of antipsychotic pharmacological agents, we are in need of alternate modalities for treating schizophrenia or augmenting the antipsychotic medications currently employed. Neuromodulation is a new frontier in the investigation of effective treatment options for schizophrenia. Among the different methods of neuromodulation, transcranial magnetic stimulation (TMS) is one that has been investigated the most thoroughly in randomized, controlled trials over the past 15 years. The purpose of this article is to review the literature with regard to the efficacy and safety of TMS on the treatment of positive and negative symptoms in schizophrenia. TMS is a noninvasive neurostimulation technique that uses alternating magnetic fields to induce electrical current in the cortex of the brain. In 2008, a TMS device from Neuronetics (Malvern, Pennsylvania) was the first to be approved by the United States Food and Drug Administration (FDA) for its use in the treatment of patients who have had a major depressive episode and who failed to respond to a single adequate antidepressant trial. The device was approved using the following stimulation parameters: 120-percent motor threshold, 10Hz, 4 seconds on, 26 seconds off. In 2014, the FDA expanded its approval of this device to include treatment of adult patients with MDD who have failed to benefit from any number of antidepressant medications. In 2013, a TMS?device from Brainsway (Jerusalem, Israel) was approved by the FDA, also for its use in the treatment of adult patients with MDD who have failed to benefit from any number of antidepressant medications. TMS is considered safe and well tolerated. The use of alternating magnetic fields to induce electrical current in the brain is based on Faraday’s principle. During application of TMS, an electromagnetic coil is placed on the scalp that transforms electrical activity to pulsed magnetic energy, which passes through the cranium unimpeded to induce an electrical field in the cortex. As a result, neurons depolarize and generate action potentials. If the frequency of the pulse is low (i.e., 1Hz or less), TMS has an inhibitory effect on neural circuits (through GABAnergic [gamma-aminobutyric acid-ergic] effects or long-term neuronal depression [LTD]). Conversely, if the pulse frequency is high (i.e., greater than 1Hz), an excitatory effect will be generated (through glutamergic effects or long term potentiation [LTP]). Pulses can be administered as single, paired, or in a series, called a train. TMS delivered in a train is termed repetitive TMS (rTMS). While single and paired pulse TMS are used for neurodiagnostic purposes, it is rTMS that has therapeutic benefit in psychiatric disorders. Unlike electroconvulsive therapy, no anesthesia is required when administering TMS; patients are awake and alert during treatment and can leave immediately following their session. Adverse reactions can include post-treatment mild and self-limited headache, scalp pain at the site of stimulation, and potential transient adverse effects on hearing due to the clicking sound of the machine, which can be prevented with the use of earplugs. The most serious potential adverse effect of TMS is induction of seizure, which is rare, with none reported in the pivotal trial that led to FDA approval and in which 10,000 sessions were delivered without seizure induction. Patients should be carefully screened for organic brain disease, personal history of seizure, or family history of epilepsy. Based on our literature review, research over the past 15 years supports the use of TMS as an safe and efficacious means of treating positive and negative symptoms of schizophrenia, with the most notable body of evidence supporting the reduction of auditory hallucinations. However, not all of the studies we examined showed efficacy of TMS, and a number of the studies we examined had negative results. Literature review for this article was conducted via Ovid Medline and PubMed databases. The search was carried out using the terms TMS, repetitive transcranial magnetic stimulation, negative symptoms, positive symptoms, schizophrenia, and neuromodulation for the years 1996 to November 2013. Searches were conducted for original papers, reviews, and meta-analyses. A hand search for relevant publications was conducted using references of articles reviewed. Articles included in our analysis were randomized, controlled trials and meta-analyses, while individual case reports, case series, and opinion pieces were excluded. Our searches yielded a total of 45 papers. Of these, 31 were considered relevant, and all of these studies were included in our analysis. Articles that were not published in English were excluded. TMS for positive symptoms. Clinical studies. In 2000, Hoffman et al conducted a double-blind crossover study of 12 patients with schizophrenia. Patients received 1Hz TMS at 80 percent of the motor threshold over the left temporo-parietal cortex for 15 to 30 minutes. All of these patients remained on their antipsychotic medications, and their auditory hallucinations were assessed using the Positive and Negative Syndrome scale (PANSS). Reductions in hallucination severity were found to be significant after active treatment as opposed to sham. Interestingly, it was noted that in patients on anticonvulsant medications, treatment effects were reduced. This could indicate the need for higher stimulus dose or a reduction or omission of anticonvulsants. Also the dosing here was infra-motor threshold, making it unlikely that the trial would be positive. Hoffman et al extended their data further in 2003 with a double-blind, crossover trial of 24 patients who received 1Hz TMS over the left temporo-parietal cortex at 90 percent motor threshold for 8 to 16 minutes over seven days while being maintained on their current psychotropic medications. Diverging from previous protocol, auditory hallucinations were assessed using the Hallucination Change Scale14 as the primary measure. Seventy-five percent of the patients demonstrated a positive response following the active phase of TMS compared to 17 percent in the sham phase. Patients also carried a counter to track hallucination frequency, for which the active group showed a linear decrease over time. For more than half of the patients in this trial, treatment effects lasted 15 weeks. In 2004, McIntosh et al attempted to replicate the results of the Hoffman et al14 study. Sixteen patients received 1Hz TMS over the left temporo-parietal cortex at 80 percent motor threshold for 8 to 16 minutes for one week before crossing over to sham treatment and vice versa. Auditory hallucinations were evaluated using PANSS. Interestingly, 11 of these 16 patients had received clozapine in the past. No significant effect was found between the active treatment and sham groups. However, this population of patients, with known past treatment failures, may have been particularly resistant to treatment. In addition, the very small sample size indicates that this study was underpowered to detect a treatment effect between groups, and its design is subject to carryover effects. In 2005, Poulet et al replicated the study by McIntosh et al supporting the use of TMS to treat auditory hallucinations. This study involved 10 patients with treatment-resistant auditory hallucinations in a double-blind crossover design. The active TMS treatment involved 1Hz TMS over the left temporo-parietal cortex with a stimulus of 90 percent of the motor threshold, receiving 10,000 stimuli over five days with a one-week washout before one week of sham treatment. Auditory hallucinations were assessed using the Auditory Hallucination Rating scale (AHRS), which revealed a significant decrease in scores during the active phase as opposed to sham. There was a mean improvement in AHRS scores of 56 percent in five days. TMS at low frequency provided significant benefit in reducing auditory hallucinations. The dose (i.e., pulses delivered) of TMS was higher than in previous trials. These findings were consistent with the Hoffman et al14 study in 2003. Similar to Hoffman’s findings, it was also noted that patients on anticonvulsant medications did not respond as well to treatment. Between 2005 and 2007, a plethora of studies was published in the area of TMS treatment for auditory hallucinations. [18–23] Chibbaro et al reported a significant long-term reduction in auditory hallucinations in 16 patients with schizophrenia. These patients were taking atypical antipsychotics and were treated with TMS, with a return to baseline in their sham group. In 2005, Lee et al19 reported that both left- and right-sided TMS applied at low frequency significantly reduced auditory hallucinations in a group of 39 patients with schizophrenia and treatment-refractory auditory hallucinations. Brunelin et al reported significant reduction in auditory hallucinations in 24 right-handed, treatment-refractory patients with schizophrenia who were treated with TMS. These patients were randomly selected into sham or active treatment groups for rTMS to the left temporoparietal cortex. In 2006, Jandl et al conducted a randomized, crossover, sham-controlled trial of TMS over the left and right temporo-parietal cortex in 16 patients with auditory hallucinations but not necessarily schizophrenia. Five patients who only received treatment of the left hemisphere responded. Group mean hallucination scores did not differ across treatment conditions. Bagati et al conducted a study in 2009 that included 40 patients with schizophrenia who were randomized to either an experimental group or a control group. Both groups were treated with standard antipsychotics following a 10-day experimental phase in which the experimental group received low frequency TMS over the left temporo-parietal cortex. Auditory hallucinations were significantly reduced in the experimental group of patients. Vercammen et al reported significant reduction in hallucination frequency in patients with schizophrenia who received TMS to the left temporo-parietal region, as well as a reduction in self-reported affective responsiveness in patients who received TMS to bilateral temporoparietal regions. There have also been a number of negative studies on the use of TMS in patients with schizophrenia. [24–28] Fitzgerald et al did not find a difference in therapeutic effect in domains such as frequency, duration, location, intensity, and disruption of voices between the active and sham groups of 20 patients with either schizophrenia or schizoaffective disorder who suffered from moderate to severe treatment-resistant negative symptoms. However, they did report a significant reduction in the loudness of hallucinations. In 2006, Saba et al treated 18 patients with schizophrenia and refractory auditory hallucinations with TMS for 10 days. TMS was applied over the left temporoparietal cortex with a stimulus of only 80-percent motor threshold. The authors reported no significant differences between the active and sham groups. Rosa et al reported safe administration of TMS concurrently with clozapine in 11 patients with schizophrenia but did not reveal significant reduction in auditory hallucinations. A large randomized trial in 2011 using fMRI to guide TMS treatment site failed to produce positive results in reducing severity of auditory hallucinations. This study involved 63 patients who specifically suffered from treatment- resistant auditory/visual hallucinations. In 2011, a study by DeJesus et al was done using TMS on 17 patients with refractory schizophrenia who suffered from auditory hallucinations and were being treated with clozapine. The authors reported no significant reduction in auditory hallucinations using TMS. In total, we found 16 controlled studies and two open-label studies using low frequency TMS. [12–32] Of the randomized, controlled studies, 10 studies involving a total of 257 subjects with psychosis revealed positive results in treating auditory hallucinations with TMS, while eight studies involving a total of 284 subjects with psychosis did not show any efficacy using TMS. Meta-analyses. A meta-analysis done by Aleman et al in 2007 analyzed data from 10 sham-controlled trials of low frequency TMS applied to treat auditory hallucinations in schizophrenia. Pre- versus post-treatment mean standardized effect size was reported 0.76, supporting a robust efficacy of this modality in reducing the severity of auditory hallucinations. A second meta-analysis on the same topic was done in 2009 by Freitas et al, which further bolstered the evidence in support of using TMS to treat auditory hallucinations in schizophrenia. Pre- versus post- treatment effect within the two arms of treatment was 1.28. Similar to Aleman’s findings, the effect size for sham-controlled studies was 1.04 (large treatment effect). Both analyses[29,30] provide evidence for a significant and robust effect on auditory hallucinations in patients with schizophrenia. TMS was used to stimulate the left temporo-parietal cortex at low frequencies. However, as we indicated above, when the broader literature base is taken into consideration, a total of 10 studies yielded positive results whereas eight did not. A systematic review done by Soltema in 2013 compared 25 randomized, control trials using the severity of the hallucinations or psychosis as the primary outcome measure. No differences were seen with the severity of psychosis. The severity of hallucinations was significantly reduced with paradigm of left temporoparietal TMS at 1hz. Other paradigms were measured, and were unable to make a difference in hallucination severity. A review of controlled and uncontrolled studies in the treatment of auditory hallucinations using low frequency TMS to the left temporo-parietal cortex supports the hypothesis that TMS can reduce these symptoms. [12–32] Results vary across studies and this could be attributed to the heterogeneity of study methodology. There is some indication that the dose of TMS has some bearing on the efficacy. One out of three reviewed studies that used a dose of 80 percent of motor threshold showed positive results (33%) in reducing auditory hallucinations, while seven out of 12 reviewed studies that used 90 percent of MT dose (58%) and both of two reviewed studies (100%) that used a dose of 100 percent or more than motor threshold showed positive results in reducing auditory hallucinations. However, more data are necessary to understand the relationship between the dose of TMS and efficacy in treating auditory hallucinations. In addition, the other factors that are likely to impact the efficacy of TMS include treatment-resistant symptoms, use of associated medication, such as anticonvulsants. As TMS is a well tolerated treatment with no major complications or neurocognitive impairment, it is potentially an attractive treatment modality for treatment-resistant auditory hallucinations. 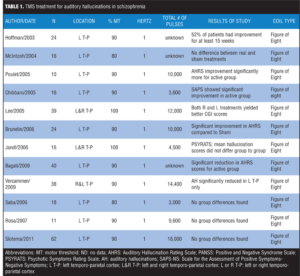 Table 1 lists the reviewed literature on use of TMS for treatment of auditory hallucinations in schizophrenia. The very first study of TMS for negative symptoms was carried out in 2000 by Rollnik et al. In a double-blind, crossover study, 12 patients with schizophrenia were treated with two weeks of daily left prefrontal TMS versus two weeks of sham stimulation, yielding a significant decrease in the Brief Psychiatric Rating scale (BPRS) with active TMS. Another study by Hajak et al in 2004 conducted a sham-controlled study of 20 patients with schizophrenia who received high frequency TMS over 10 days to the left dorsolateral prefrontal cortex. At the end of the study, functional neuroimaging was performed. There was a significant reduction in negative symptoms and depressive symptoms, while positive symptoms seemed to worsen. However, no changes were noted on the neuroimaging. Goyal et al showed improvement of negative symptoms in their double-blind, sham-controlled study of 10 right-handed patients diagnosed with schizophrenia. Prikryl et al also found improvement in negative symptoms in their randomized, sham-controlled study of 22 patients with schizophrenia who had prominent negative symptoms and were stabilized on antipsychotic medication. Schneider et al used 10Hz TMS at 110 percent of the motor threshold over the left dorsolateral prefrontal cortex in 51 patients with schizophrenia, which showed significant benefit in reducing negative symptoms as well as neurocognitive deficits. Cordes et al found mild to moderate benefit using 10Hz stimulation at 110-percent motor threshold in a sham-controlled trial of 35 individuals with chronic schizophrenia. In a group of 22 chronic, hospitalized patients with schizophrenia, high frequency TMS was not found to have a therapeutic effect. Novak et al in 2006 were unable to show that high frequency TMS over the left dorsolateral prefrontal cortex would reduce negative symptoms in 16 patients with schizophrenia who had predominant negative symptoms and were stabilized on antipsychotic medication. This study only used 90-percent motor threshold with a total of 2000 stimuli per session. Although Mogg et al did not see improvement in negative symptoms, they did see some improvement in cognitive function in their study of 17 right-handed patients with schizophrenia who were treated with TMS. In a two-armed, double-blind, randomized, controlled trial, Fitzgerald et al investigated the efficacy of bilateral high frequency TMS to treat moderate-to-severe, treatment-resistant negative symptoms in 20 patients with schizophrenia or schizoaffective disorder. The authors found no substantial benefit. This study used bilateral high frequency TMS as compared to many trials where TMS is used unilaterally. Also, this study had a three-week treatment period, which may be too short of a course for longstanding negative symptoms of schizophrenia. Meta-analyses. Opinions vary as to the effectiveness of high frequency TMS in treating negative symptoms of schizophrenia. A meta-analysis completed in 2009 that included eight studies of high frequency (10Hz) stimulus applied to the left dorsolateral prefrontal cortex in patients with schizophrenia showed an effect size of 0.58. When three open-label trials were excluded from analysis, the effect size for the controlled studies dropped to 0.27. This was appropriately interpreted by the authors as a marginal effect. A second meta-analysis examined seven controlled studies of high frequency to the left dorsolateral prefrontal cortex in patients with schizophrenia and reported an effect size of 0.63. As effect sizes for antipsychotic medication treatment of negative symptoms range from 0.17 to 0.21, those of TMS ranging from 0.27 to 0.63 are encouraging. Table 2 lists the reviewed literature on use of TMS for treatment of negative symptoms of schizophrenia. In 2007, in a multicenter study, researchers looked at safety and efficacy of TMS in the treatment of major depression. Of the 301 subjects in the study, the only adverse event attributed to TMS at a rate higher than placebo/sham was scalp discomfort (occurring in 38.5% of subjects for a 1-week period at the start of the TMS course). No seizures occurred. Based on our examination of the literature from the past 15 years, we conclude that the use of TMS in schizophrenia has its greatest efficacy in treating auditory hallucinations. The frequency and severity of auditory hallucinations, in particular, may be decreased by targeting low frequency TMS stimuli to Wernicke’s area in the left temporo-parietal cortex. Since 20 percent of patients with schizophrenia experience treatment-resistant auditory hallucinations, further studies to assess the efficacy of TMS in both inpatient and outpatient populations are merited. Based on our examination of the literature, reduction of negative symptoms using high frequency TMS to the dorso-lateral prefrontal cortex is encouraging given our current lack of treatment options for these debilitating symptoms. Positive results in reducing cognitive symptoms in schizophrenia are also promising and warrant further study of the efficacy of TMS on cognitive symptoms of schizophrenia. 1. O’Reardon J , Solvason H, Janicak P, et al. Efficacy and safety of transcranial magnetic stimulation in the acute treatment of major depression: a multisite randomized controlled trial. Biol Psychiatry. 2007;62:1208–1216. 2. Stanford A, Corcoran C, Bulow P, et al. High frequency prefrontal rTMS for the negative symptoms of schizophrenia: a case series. J Ect. 2011; 27:11–17. 3. Hoffman RE, Boutros NN, Berman RM, et al. Transcranial magnetic stimulation of left temporoparietal cortex in three patients reporting hallucinated “voices.” Biol Psychiatry. 1999;46(1):130–132. 4. Howes O, Egerton A, Allan V. Mechanisms underlying psychosis and antipsychotic treatment response in schizophrenia: insights from PET and SPECT imaging. Curr Pharm Des. 2009;15:2550–2559. 5. Mitchell A, Selmes T. Why don’t patients take their medicine? Reasons and solutions in psychiatry. Adv Psychiatr Treat. 2007;13:336–346. 6. Levkovitz Y, Isserles M, Padberg F, et al. Efficacy and safety of deep transcranial magnetic stimulation for major depression: a prospective multicentered randomized controlled trial. World Psychiatry. 2015;14:64–73. 7. Ji R, Schlaepfer T, Aizenman C. Repetitive transcranial magnetic stimulation activates specific regions in rat brain. Proc Natl Acad Sci. 1998;95:15635–15640. 8. Chen R, Classen J, Gerloff C, et al. Depression of motor cortex excitability by low-frequency transcranial magnetic stimulation. Neurology. 1997;48:1398–1403. 9. O’Reardon JP, Peshek AD, Romero R, Cristancho P. Neuromodulation and transcranial magnetic stimulation (TMS): a 21st century paradigm for therapeutics in psychiatry. Psychiatry (Edgmont). 2006;3(1):30–40. 10. Chen R, Samii A, Caños M, et al. Effects of phenytoin on cortical excitability in humans. Neurology. 1997;49(3):881–883. 11. Wassermann E, Lisanby S. Therapeutic application of repetitive transcranial magnetic stimulation: a review. Clin Neurophysiol. 20011.12(8):1367–1377. 12. Hoffman R, Boutros N, Hu S, et al. Transcranial magnetic stimulation and auditory hallucinations in schizophrenia. Lancet. 2000;35:1073–1075. 13. Kay SR, Opler LA, Fiszbein A. Positive and Negative Syndrome Scale (PANSS). North Tonawanda, NY: Multi-Health Systems Inc.; 2000. 14. Hoffman RE, Hawkins KA, Gueorguieva R, et al. Transcranial magnetic stimulation of left temporoparietal cortex and medication-resistant auditory hallucinations. Arch Gen Psychiatry. 2003;60(1):49–56. 15. McIntosh AM, Semple D, Tasker K, et al. Transcranial magnetic stimulation for auditory hallucinations in schizophrenia. Psychiatry Res. 2004;127:9–17. 16. Poulet E, et al. Slow transcranial magnetic stimulation can rapidly reduce resistant auditory hallucinations in schizophrenia. Biol Psychiatry, 2005; 57:188-91. 17. Haddock G. Auditory Hallucination Rating Scale (AHRC). Manchester, UK: University of Manchester; 1994. 18. Chibbaro G, Daniele M, Alagona G, et al. Repetitive transcranial magnetic stimulation in schizophrenic patients reporting auditory hallucinations. Neurosci Lett. 2005;383:54–57. 19. Lee SH, Kim W, Chung YC, et al. A double blind study showing that two weeks of daily repetitive TMS over the left or right temporoparietal cortex reduces symptoms in patients with schizophrenia who are having treatment-refractory auditory hallucinations. Neurosci Lett. 2005;376(3):177–181. 20. Brunelin J, Poulet E, Bediou B, et al. Low frequency repetitive transcranial magnetic stimulation improves source monitoring deficit in hallucinating patients with schizophrenia. Schizophr Res. 2006;81:41–45. 21. Jandl M, Steyer J, Weber M, et al. Treating auditory hallucinations by transcranial magnetic stimulation: a randomized controlled cross-over trial. Neuropsychobiology. 2006;53:63–69. 22. Bagati D, Nizamie S, Prakash R. Effect of augmentatory repetitive transcranial magnetic stimulation on auditory hallucinations in schizophrenia: randomized controlled study. Aust N Z J Psychiatr. 2009;43:386–392. 23. Vercammen A, Knegtering H, Bruggeman R, et al. Effects of bilateral repetitive transcranial magnetic stimulation on treatment resistant auditory-verbal hallucinations in schizophrenia: a randomized controlled trial. Schizophr Res. 2009;114:172–179. 24. Fitzgerald PB, Herring S, Hoy K, et al. A study of the effectiveness of bilateral transcranial magnetic stimulation in the treatment of the negative symptoms of schizophrenia. Brain Stimul. 2008;1:27–32. 25. Saba G, Verdon CM, Kalalou K, et al. Transcranial magnetic stimulation in the treatment of schizophrenic symptoms: a double blind sham controlled study. J Psychiatr Res. 2006;40:147–152. 26. Rosa MO, Gattaz WF, Rosa MA, et al. Effects of repetitive transcranial magnetic stimulation on auditory hallucinations refractory to clozapine. J Clin Psychiatry. 2007;68:1528–1532. 27. Slotema CW, Blom JD, de Weijer AD, et al. Can low-frequency repetitive transcranial magnetic stimulation really relieve medication-resistant auditory verbal hallucinations? Negative results from a large randomized controlled trial. Biol Psychiatry. 2011;69:450–456. 28. de Jesus DR, Gil A, Barbosa L, et al. A pilot double-blind sham-controlled trial of repetitive transcranial magnetic stimulation for patients with refractory schizophrenia treated with clozapine. Psychiatry Res. 2011;188:203–207. 29. Aleman A, Sommer I, Kahn R. Efficacy of slow repetitive transcranial magnetic stimulation in the treatment of resistant auditory hallucinations in schizophrenia: a meta-analysis. J Clin Psychiatry. 2007;68:416–421. 30. Freitas C, Fregni F, Pascual-Leone A. Meta-analysis of the effects of repetitive transcranial magnetic stimulation (rTMS) on negative and positive symptoms in schizophrenia. Schizophr Res. 2009;108:11–24. 31. Blom S, Van Lutterveld R, Hoek H, et al. Review of the efficacy of transcranial magnetic stimulation for auditory verbal hallucinations. Biol Psychiatry. 2013;76:101–110. 32. Rollnik JD, Huber TJ, Mogk H, et al. High frequency repetitive transcranial magnetic stimulation (rTMS) of the dorsolateral prefrontal cortex in schizophrenic patients. Neuroreport. 2000;11:4013–4015. 33. Overall JE, Gorham DR. The Brief Psychiatric Rating Scale. Psychologic Rep. 1962;10:799–812. 35. 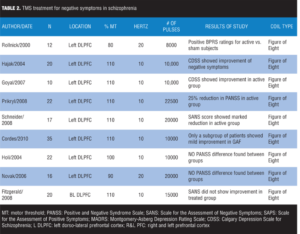 Goyal N, Nizamie S, Desarkar P. Efficacy of adjuvant high frequency repetitive transcranial magnetic stimulation on negative and positive symptoms of schizophrenia:preliminary results of a double-blind sham-controlled study. 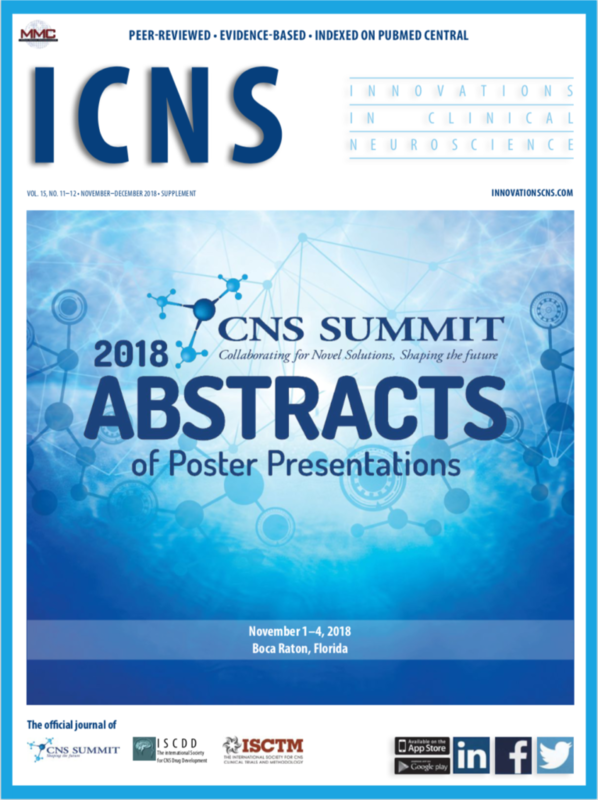 Neuropsychiatry Clin Neurosci. 2007;19:464–467. 36. Prikryl R, Kasparek T, Skotakova S, et al. Treatment of negative symptoms of schizophrenia using repetitive transcranial magnetic stimulation in a double-blind, randomized controlled study. Schizophr Res. 2007;95:151–157. 37. Schneider A, Schneider T, Stark H. Repetitive transcranial magnetic stimulation (rTMS) as an augmentation treatment for the negative symptoms of schizophrenia: a 4-week randomized placebo controlled study. Brain Stimul. 2008;1:106–111. 38. Cordes J, Thünker J, Agelink MW, et al. Effects of 10 Hz repetitive transcranial magnetic stimulation (rTMS) on clinical global impression in chronic schizophrenia. Psychiatry Res. 2010;177:32–36. 39. Holi MM, Eronen M, Toivonen K, et al. Left prefrontal repetitive transcranial magnetic stimulation in schizophrenia. Schizophr Bull. 2004;30:429–434. 40. Novák T, Horácek J, Mohr P, et al. The double-blind sham-controlled study of high-frequency rTMS (20 Hz) for negative symptoms in schizophrenia: negative results. Neuroendocrinol Lett. 2006;27:209–213. 41. Mogg A, Purvis R, Eranti S, et al. Repetitive transcranial magnetic stimulation for negative symptoms of schizophrenia: a randomized controlled pilot study. Schizophr Res. 2007;93:221–228. 42. Dlabac-de Lange J, Knegtering R, Aleman A. Repetitive transcranial magnetic stimulation for negative symptoms of schizophrenia: review and meta-analysis. J Clin Psychiatry. 2010;71:411–418.